The cost of heroin rehab varies from $100-1,000 per day. 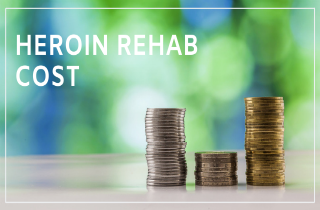 We explore treatment options during heroin rehab here and introduce some ideas for how to cover your costs. Find a way, not an excuse. Help is available today. Two grams of heroin per day can cost over $50,000 a year. That is more than enough to cover the cost of a high quality rehab. Sometimes people make excuses because they are afraid of what will happen in treatment. They fear change and they fear failure. In this article, we will explore the different types of rehab available to people facing heroin addiction. We’ll outline the average costs associated with treatment. We’ll also offer you some cost-savings tips and invite your questions about heroin rehab at the end. Treatment can save your life! Don’t give up the chance to live heroin free. Get confidential help now at 1-877-960-1631. Is Heroin Rehab Worth It? In fact, you do not need to be intimidated by the prospect of treatment. Quite the opposite, heroin rehab programs offer a variety of treatment options. Reputable programs will screen you and then adjust treatments just for your needs. But what’s most important is that inpatient rehab treatment offers round the clock care, expertise and support on your way to sobriety. You don’t need to do it alone! Recovery from heroin addiction is meant to change your life for the better, and that’s what makes the cost of rehab worth it. A methadone maintenance program has an average cost of ~$100 per week per person. Non-methadone outpatient programs will set you back around $140 per week per person. An intensive outpatient program has an average cost of $370 per week per person. And an adult residential program will cost a whopping $715 per person per day, or almost $20,000 per month. What Is Heroin Rehab Like? Rehab is like a combination of adult education, psychotherapy, and summer camp. As you get heroin out of your system, you’ll start to stabilize and use the time in rehab to make a new start. Routines are very structured. You sleep and eat at the same times. This way, your mind and body start the process of health. Inpatient heroin rehab – Due to the highly addictive nature of heroin and the impact heroin has on the body and the mind, inpatient treatment programs are usually most effective in treating heroin addiction. They provide support around the clock, particularly during detox. During inpatient rehab, you can expect to stay overnight, attend very structured daily sessions for psychotherapy and addiction education, and be encouraged to exercise. Opiate substitution medications may be given, and a doctor or psychiatrist will be on hand to help during your entire stay. Outpatient heroin rehab – Outpatient rehab programs are usually held in standalone clinics and are NOT supervised by a medical doctor. Instead, licensed clinical psychologists and addiction counselors hold group sessions which you attend daily or weekly. Intensive outpatient treatment requires 9+ hours of attendance in psychotherapy and education sessions per week, while less intensive programs require 9 hours of work. How Long Does Rehab for Heroin Last? The length of time spent in a heroin rehab varies from person to person. The average stay is 30 days for inpatient rehab and 10 weeks for outpatient heroin rehab. Some facilities offer longer programs that have duration of up to 90 days or more. The length of time you stay in rehab will affect final cost. But severe addiction to heroin may require treatment of at least 3 months, up to 6 months or a year. 1. Type of rehab – There is a big difference in the price of inpatient and outpatient programs. The costs of inpatient programs is always higher due to housing, intensive care, 24-hour supervision, and medications are calculated in the cost. 2. Duration of stay – Another thing that determines the cost of rehab is how long are you staying in treatment. The cost of these programs also depends on the length, but can run from $100 per day for outpatient up to 700-$,1000 per day for inpatient stays. 3. Location – Cost of the program varies by location. Rehabs in a state with a higher cost of living, are more expensive. 4. Treatments offered – Heroin detox is accompanied by an intense withdrawal and the intensity of the symptoms require medication assistance. The cost of medications is calculated into the price of detox and treatment stay. Plus, some specific therapies such as professional counseling also affect how much you could pay. 5. Amenities – The amenities offered by a rehab also form the price of your recovery. Besides standard amenities that include detox, medication and therapy, offerings such as massages, acupuncture, swimming pools, tennis courts, large rooms and gourmet meals dictate the cost of treatment. Luxury rehabs may reach a price of tens of thousands of dollars per month. The logic goes like this: more amenities mean a higher price tag. But there are ways you can manage the cost of heroin treatment. First, you can seek out state or local government support. Government funded programs are available at low or very low cost. These programs usually focus on outpatient services but can get you the help you need. Additionally, you can avoid high end facilities. Luxury rehabs may have a greater range of spa amenities and better settings. But you may end up paying for things you don’t need. Next, you can deduct expenses incurred during heroin rehab from your taxes. Medical care expenses can be claimed at tax time. This includes payments for the diagnosis, cure, mitigation, treatment, or prevention of disease, or payments for treatments affecting any structure or function of the body. Health care insurance or Medicare can also offset the cost of heroin rehab. Finally, you can seek sliding scale fees when you pay out-of-pocket. Contact rehab centers directly and talk with and intake counselors who can work with you on financing heroin rehab on a sliding scale fee based on your income. If you want to recover from addiction, rehab can help. Have more questions about the cost of heroin rehab or its processes? Please contact us using the comment form below. We welcome any questions, comments or concerns about anything you have read in this article. And we’ll do our best to respond to you personally and promptly.